B.C. conservation officers are investigating a video that appears to show a couple in an ATV chasing a moose along a forestry back road. The moose appears exhausted in the video, according to Dave Webster. B.C. conservation officers are investigating a video that appears to show two B.C. residents in an ATV chasing a moose along a forestry back road. The exact location isn't clear, but the incident is being investigated by Dave Webster, a conservation officer in B.C. 's West Kootenay region. According to the description of the original YouTube video, the chase took place near Greenwood, B.C. Webster confirmed Friday that the couple in the video are B.C. residents and that he is in the process of contacting them. Webster says he has not yet spoken to the people in the video. This is not the first time conservation officers in the province have investigated allegations of moose harassment. Earlier this year they investigated after a YouTube video surfaced showing an unidentified man jumping on and riding a moose. The cow moose in this latest video appears stressed, Webster said. "To the point of exhaustion"
"The animal at the end, is run to the point of exhaustion and that's basically what, in the end, results in the animal getting off the road and allowing that ATV to get by," said Webster. He says moose and other deer species panic when they are in flight mode. "Most of the deer species react in the same way, they get stressed very easily. [The road] is the path of least resistance," he said, explaining why the moose did not simply run into the bushes to evade the ATV. With colder weather on the way, Webster says encounters with moose on roads may happen more often. 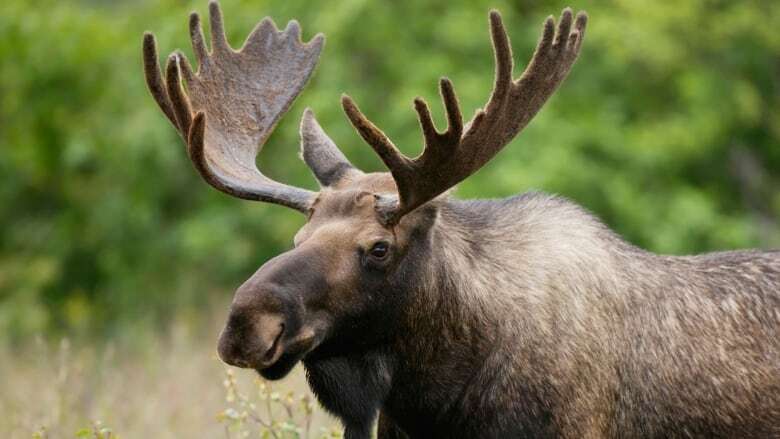 "Moose especially are susceptible, more in wintertime when there's heavy snow, in that they like to travel those areas and it's easier for them to get around and they will stick to those roadways." He says people should give wildlife the time and space to get off the road. "It may take a bit of effort and you may have to taken an alternative route even, but it's in the long run, better for yourself and the wildlife involved." To listen to the full audio, click the link labelled: Conservation officer investigates moose chaser video.